If you have a border collie in your home, this is a must-read article as it guides in picking the best dog food for your friend(s). Whether you have a puppy, an adult, or an elderly border collie, we have got you covered. We have also addressed the need for high-quality dog food for pets with stomach, skin, or hypersensitivity problems. Are you looking to start your dog on a naturally balanced diet to promote health? You can never go wrong with some lamb meat and brown rice. 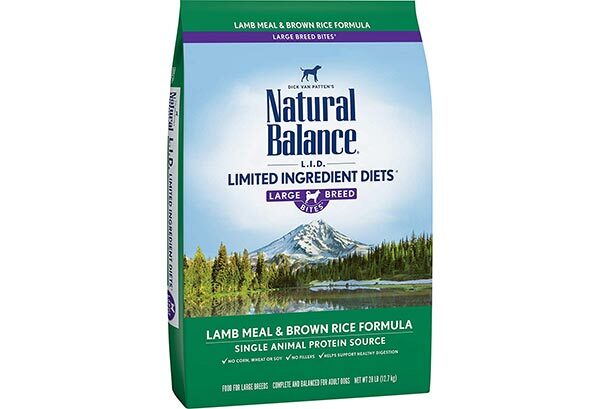 Natural Balance Limited Ingredient Diets Dry Dog Food contains 10% moisture, 21% protein, 12% fat, 4% fiber, 0.30% Omega 3, 1.7% Omega 6, Calcium 1%, Phosphorus 0.80%, 3410kcal/kg calories (355 kcal/cup). Each 28-pound bag is made such that the number of ingredients your pet is exposed to are minimal. The food is processed such that the Border Collies can chew much slower and properly for better digestion. This dog food supports the maintenance of clean teeth while eating. Furthermore, the food promotes the development of a healthy and strong gum for the dogs. When being processed, artificial flavors, colors, and preservatives are avoided. This makes this dog food super healthy even for dogs with food sensitivity. It uses single animal protein source hence suitable for dogs with hypersensitivity and allergic to various foods. It is high-quality dog food that promotes fast growth and proper digestion. The food is processed in the size so dogs love chewing it. The blend of the ingredients featured may be bad for dogs with certain allergies and bowel problems. 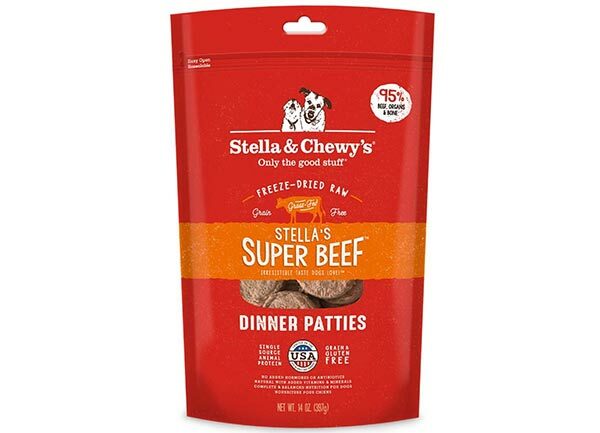 The dog may get bored after eating this food for a while since it comes in a single flavor. Do you own an adult Border Collie and are in search of organic whole grain food to keep it happy and healthy? 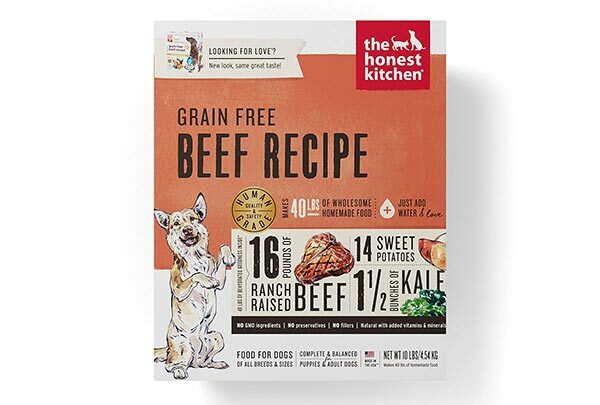 If you do, Honest Kitchen Revel dog food might have been processed just for your dog. It contains high-quality protein obtained from ranch-raised beef. The food has then undergone dehydration with the aim of improving its nutritional content so it is suitable for both adult dogs and puppies. The food had been processed as human grade with a mixture of free range chicken recipe and organic grain. Active adult dogs can get enough energy to push through the day’s activities. This dog food has no preservatives so it is super healthy. Featuring human grade ingredients, all you need to do is add some warm water and you have your mouth-watering meal. It is made with all natural ingredients and no preservatives, by-products, genetically modified organisms, and other harmful ingredients. The food is processed in a human grade facility in the USA. It is highly concentrated for maximum nutrient content. This dog food is easily digestible thus appropriate for dogs with stomach and bowel problems. The food is given a lighter touch so it can be chewed and ingested with ease. It is AAFCO complete and a balanced meal so it can promote proper and healthy growth. Some buyers may be put off this dog food by the somewhat bad smell. 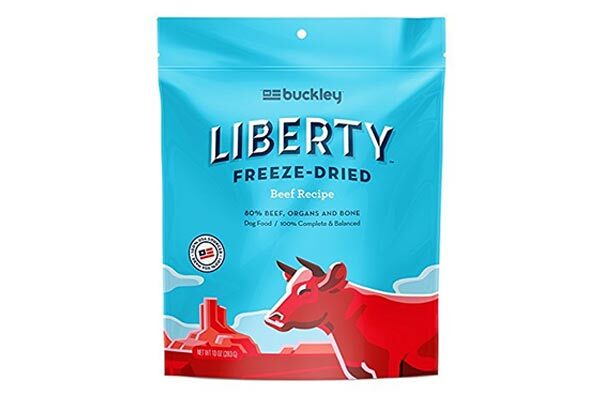 Buckley Liberty Freeze-Dried Dog Food is amazing sine you can use it as a meal, topper, or treat. You can opt to feed your dog the food as it is or add some water to make it more re-hydrated. All the ingredients used to make this dog food are sourced in the USA, thus assuring you of superior quality. Moreover, the manufacturer of this dog food eliminates the use of fillers like soy, corn, wheat etc. to give it improved nutritional value. This Liberty dog food is purely made of nutritious animal ingredients mixed with some fresh vegetables and healthy fats. It is grain-free, which makes it ideal for dogs that are allergic to grain protein etc. For the provision of natural high-quality Omega 3 and 6, this dog food features salmon, fish oils, and flaxseed. As such, dogs that eat this food will have reduced inflammation, improve blood pressure, healthy skin, and coat. 80% of this dog food is made up of meat, bones, as well as animal organs. These are sources of top quality protein and they are blended with fresh vegetables and healthy fats to create a balanced diet for your let. The raw bones incorporated made the food rich in calcium, phosphorous, and essential enzymes. It promotes optimal growth thanks to the use of whole animal nutrition with antioxidant-rich vegetables and healthy oils. It can be used as a meal, treat, or topper. The food provides a complete and balanced diet for dogs. Some users find this dog food to be a little pricy. Is your dog 7 years old and above? If it is, you need to get it this active longevity small bites natural food to aid in restoring its youth. The food will give the dog enough energy to stay active despite its age. The food is processed with Omega-6 fatty acids blended with vitamin E alongside other healthy nutrients. This, in turn, promotes healthy skin and coat. The natural ingredients featured are thoughtfully mixed with important vitamins, minerals, and amino acids that will keep your pet going. Moreover, it is free of artificial preservatives, flavors, and colors that would otherwise lower its quality. This top quality dog food is processed with smaller size kibble so the elderly dog can chew with ease. This dog food is made in the USA using superior quality ingredients reliable for proper pet growth. It is available in two kibble sizes for the variety of choice. The food is made with clinically proven ingredients to provide maximum youthful energy. For an easy time, while chewing, senior dogs need it soaked and not crunchy as it comes. 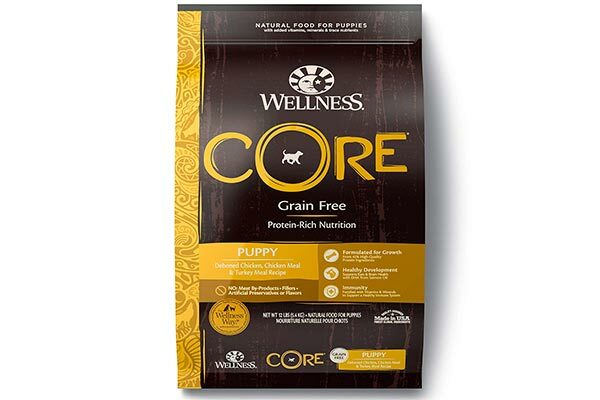 Wellness CORE Natural Dry Dog Food might be the best grain-free meal for puppies. It is made with chicken and turkey recipe to create the tastiest and healthiest diet for puppies’ optimum growth. This food is further processed with salmon oil, fruits, and vegetables for a more nutritious meal for your little pet(s). It is also fortified with antioxidants, probiotics, vitamins, and minerals for various health benefits. Omega 3 and 6 are obtained from the fish and flax seeds used. They aid in the development of healthy skin and coat, increased production of DHA for brain and eye development. The food is also rich in calcium and phosphorus that strengthen the puppies’ bones and teeth. It comes in smaller kibble size so that the puppies can pick up and chew readily. Your puppy will definitely enjoy this nutritious meat-based food. With a caloric content of 417 kcal/cup, your puppy is bound to attain the desired energy levels for active living. It is grain-free, has no meat by-products or other fillers that could compromise the protein quality. It is made of all natural chicken and turkey meat that are premium quality sources of protein. The food is made in the USA, which provides 100% wellness guarantee. It has Dha-rich ingredients that make it great for optimal growth and development in puppies. The food may not be such a good idea for puppies with a hypersensitive digestive system. This is the kind of food you need to get your puppies if you want them wagging their tails all day long. It comes in a variety of amazing tastes and textures so you can choose the one that best satisfies your puppy(ies). The ingredients featured are all natural including vegetables and they come rich in antioxidants, 23 essential vitamins, and minerals. The puppy will get a taste of meaty bits with a mix of crunchy kibble. This makes the food mouth-watering, not forgetting the balanced nutrition it provides. You have the opportunity to choose among savory beef and chicken flavors that your puppy is going to love. You can rely on this food for the puppy until it is fully grown since it is processed for dogs of all ages. 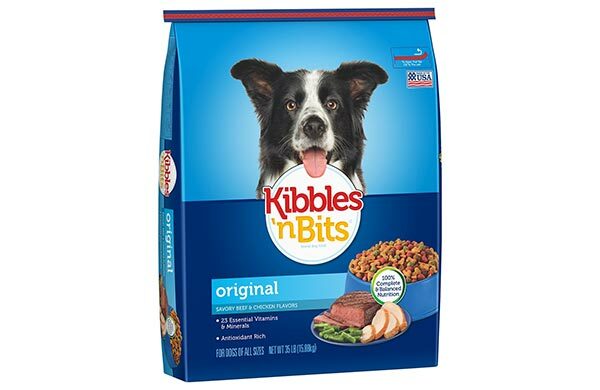 This dog food is made in the USA, which guarantees quality and improved nutrition content. The food is processed in mini kibbles so it is ideal for puppies as they chew with ease. It has high levels of antioxidants that help in reducing cases of inflammations in puppies. The high-quality beef and chicken protein are ideal for proper puppy growth. This food features some artificial additives like colors and preservatives that may cause an allergic reaction in some puppies. Is your dog overweight and are not sure which food to get him/her for healthy growth? 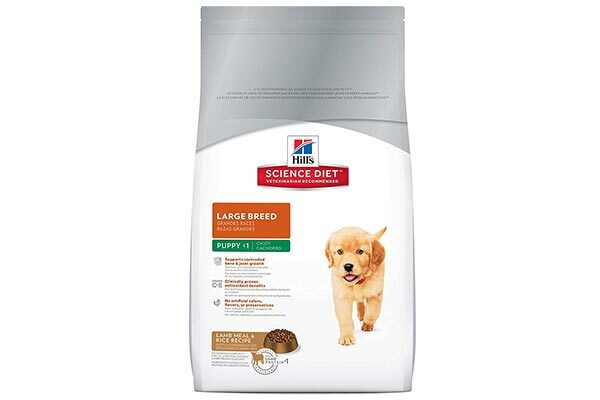 Well then, Hill’s Science Diet Puppy Large Breed Dog Food might be what you are looking for. It is specially processed for puppies that are up to 1 year old and will weight more than 55 pounds when fully grown. This dog food is made with optimal levels of essential nutrients like calcium and phosphorous that promoted controlled bond growth in dogs. What’s more, the food has glucosamine and chondroitin that promote lean muscle growth, strengthens the muscles, and joints. The food is blended with clinically proven ingredients that are sources of antioxidants with vitamin C and E. This promotes a healthy immune system so the dog is able to avoid diseases associated with being overweight. The vitamins, amino acids, and minerals featured are natural, of superior quality, and are easy to digest. This dog food is highly nutritious and flavorful so your dog is going to love it. This food can be used for puppies as well as senior dogs. It has been formulated for dogs that are overweight with the idea of promoting healthy body weight. Some users argue that this dog for is a little too pricy in comparison to the packaging sold. 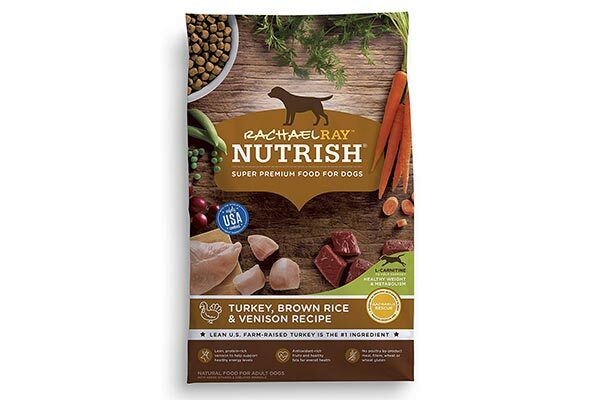 Rachael Ray Nutrish Natural Dry Food features turkey and Venison recipes that are fantastic sources of protein. It also has brown rice, which is the whole grain food used for healthy growth. These ingredients work together with minerals and vitamins to create a complete and well-balanced diet for your pet. The turkey meat used is lean and U.S. farm-raised, which makes it super healthy for dogs that are overweight. The dog food further has antioxidant-rich fruits that protect the dog’s body against inflammation. The fats featured are healthy to promote the general health of an already obese dog. It has L-Carnitine that supports healthy weight and metabolism in overweight dogs. It is gluten-free so it doesn’t add unnecessary weight. 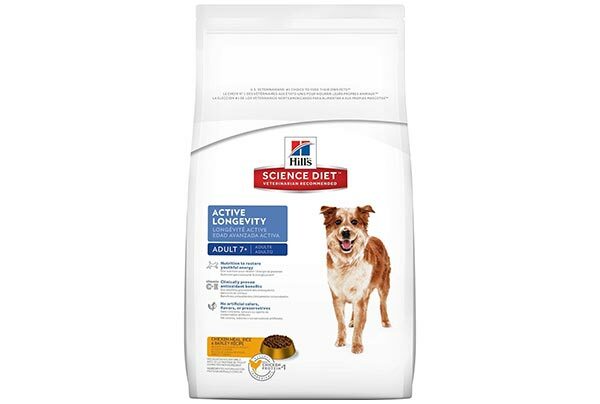 This dog food has ingredients that promote metabolism so overweight dogs can readily burn extra calories. This dog food comes with bigger sized pieces that puppies may have a hard time chewing. If you haven’t heard of Stella & Chew’s Freeze-dried raw dog food, then it is time you knew about its great attributes. To begin with, it is uniquely processed for dogs that are picky eaters. This extraordinary dog food contains 95% cage-free chicken, organs, and bone that make it a superior source of protein, vitamin, and other nutrients. The highly nutritious content of this meal is complemented by the organic fruits and veggies featured. This dried raw dog food comes with all-natural ingredients and is grain-free so it can be readily digested after ingestion. 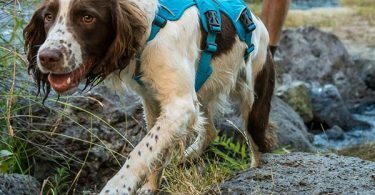 The food has further been minimally processed so it is free of artificial additives and chemicals that could make it dangerous to the dog’s health. Unlike the other dog food brands, you do not need to rehydrate this. Just scoop, mix well, and serve your pet for a meal of a lifetime. The ingredients offer relief from allergies while helping develop a shiny skin and coat for a better-looking dog. The food also improves the health of dog teeth and gums. What’s more, the dog will enjoy a healthier digestive system, improved appetite, a healthier immunity, energy boost, and increased stamina. It is crafted in the USA with its ingredients responsibly and carefully sourced. This dog food is 100% complete and balanced so it is perfect for all life stages. The raw food is nutritious and the fact that it is freeze-dried makes it convenient for feeding your dog. Some users feel that this dog food is overloaded with fats that could make some dogs sick after ingesting. Do your dogs have any skin problems or are allergic to something? 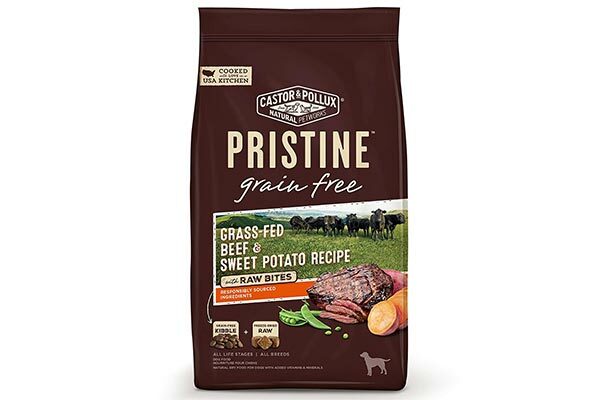 If they are, you might want to consider Castor & Pollux Pristine dog food that comes with raw bites. The manufacturer claims that this is America’s #1 organic dog food. You get to choose food with poultry, wild-caught fish, or meat depending on what you prefer or what your dog loves. Grass-fed beef is mostly used due to its high-quality amount of protein. This dog food is further mixed with fruits and vegetables so your pet develops health-wise. It also comes free of artificial additives such as preservatives and colors hence your dog is going to enjoy these kibble and freeze-dried raw bites. All the organic ingredients used are free of synthetic fertilizers or chemical pesticides so the food is safe to ingest. The ingredients are responsibly sourced so the food is safe for dogs with hypersensitivity. The food is made with highly nutritious ingredients that will promote healthy skin and coat. The protein source is mostly grass-fed beef, which is of superior quality. While it helps address skin sensitivity and allergies, the food may cause flatulence in some dogs. Once your dog digs into the Cloud Star wag, it will be wagging its tail as you have never before. It is made with bark fewer chicken meatballs dog treats that are yummy, super soft, and nutritious. This dog food features essentially nutritious ingredients like sweet potatoes, carrots, and flaxseed that will promote healthy dog growth. It is a simple, home-style recipe that is grain-free and has no fillers for healthy living. The food has 30 kcal per treat so your dig stays energized with every bite. 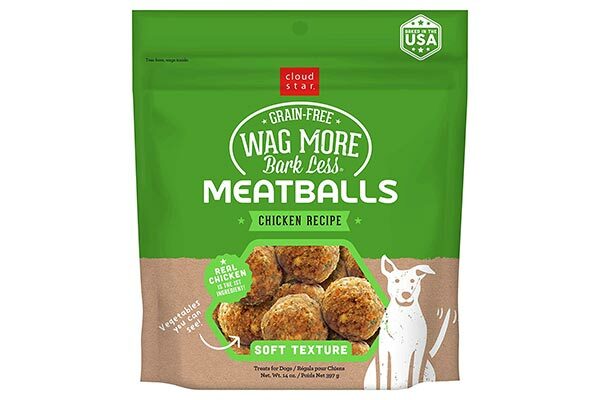 You can feed your dog with these meatballs as a main meal or just treats. The first ingredient that is bark-less chicken has been sourced in the USA. The chicken, sweet potatoes, and carrots used make soft food that is easy to chew. It is grain-free so it is readily digestible and gluten-free so it is ideal for dogs with food sensitivity. This food is perfectly dried to attain the dog’s desired flavor and texture. The dog food has preservatives that reduce its quality, especially when being used by hypersensitive dogs. 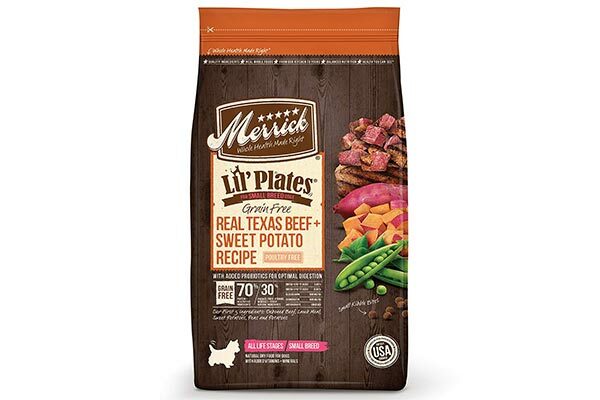 Merrick lil’ plates grain-free dog food is ideal for small Border Collies with a sensitive stomach. It is specially formulated with dry real meat, fish, or poultry depending on your preference of the first ingredient. You should know that the main ingredient will determine how high the protein content of the food will be and the general nutritional value it adds to your meal. It is appropriate for puppies since it has smaller kibble for their tiny mouths. It has nutritious farm-fresh fruits and vegetables such as apples, sweet potatoes, blueberries, peas among others. It is processed with real de-boned salmon and Omega fatty acids that improve the health of the dog’s skin and cost. The fact that it is grain-free makes it easily digestible thus ideal for dogs with stomach problems caused by food sensitivity. For better digestion, this dog food has been made with probiotics and prebiotic fiber. If your dog is sensitive to poultry ingredients, then this food should be your preferred option since it has a poultry-free recipe. The crunchy kibble bites will leave the teeth of your dog clean. It has high-quality fiber for better digestion. It is formulated with highly nutritious fruits and vegetables. The food has been cooked in the USA, which guarantees on quality. Some users feel that the kibbles are a little too smelly for the dog’s comfortable eating. How Much Food Do Border Collies Need? The amount of food your border collie needs will depend on whether it is an adult or a puppy. Puppies are fed 3 times as they wean and the portions are adjusted to 2 times as they grow up. An adult border collie may need 2 cups of freeze-dried food during lunch and dinner times. For breakfast, you could give the pet a snack, bites, or oatmeal in milk. Ensure that the food has high protein and calorie value to be of nutritious benefit to the health of the border collie. How to Feed a Border Collie? Dried food including a mix of meat, fruits, and vegetables is ideal for a border collie. Although these dogs tend to love canned food, it’s nutritional content is low. However, it has a high water content so it’s suitable if you want your border collie to stay hydrated. This meal should only be served occasionally and not made your dog’s everyday food. Avoid feeding your dog too much soft food because it will not keep its teeth clean or strengthen the teeth and jaws. The key to a balanced diet for a border collie is the ingredients featured. The best food should be made with all natural meat, fresh vegetables, fruits etc. These will boost the nutrient, mineral, vitamin, and protein content of the food. High-protein meat includes farm-raised turkey or chicken, grass-fed beef etc. Ensure that the ingredients are sourced responsibly, and they are free of any artificial additives. Salmon oil and other fish products are used as sources of Omega 3 and 6, which is essential for healthy growth in dogs. Foods with too many grains are a problem to dogs with digestive problems and stomach sensitivity. Border collies are linked to wheat, chicken, and soy as the common food allergies. However, soy and grain food allergies are the most common. This is why most dog foods are being formulated grain-free. According to a health and genetics article, beef allergies are also common among border collies. What human food can border collies eat? Nonetheless, it is ill-advised to feed a border collie these foods regularly since frequent changes in diet may cause digestive problems like flatulence. The diet needs of a border collie like any other dog vary depending on its age and health state. An adult border collie needs more calorie content than an elderly dog since the former is more active as compared to the latter. This means that since the senior dog is inactive, too much fat in its diet would lead to increased body weight. This would mean a higher probability of getting sick. According to Medical News Today, a high-calorie content will lead to increased energy production so the adult dog stays active longer. Protein is a building block of blood, muscles, bones etc. Based on an article on WebMD, protein is a macronutrient that young, adult and senior dogs require in almost similar amounts. In every border collie food, therefore, ensure that the protein content value is high to increase lean muscles. How to Choose Dog Food for Border Collies? When buying dog food for border collies, you have to first consider the size of your pet, its age, health status, and overall nutritional needs. If your border collie is pregnant or weaning, it will need a different diet from what it eats during normal times. A senior dog may need food with high-protein content in the ratio while a puppy needs some proteins but in almost the same ratio as the other ingredients. Do enough market research as to some of the best border collie foods available and how much they go for. Analyze the features that each brand comes with after considering your budget limit. Some dogs are picky, which means that you might want to look out for more delicious treats that they will enjoy. Be sure to know whether your border collie is allergic to anything, has hypersensitivity of skin, stomach, or skin problems. Do not forget to go through the testimonials of other users because they will provide more information regarding different varieties of dog foods. You can get reliable testimonials in the customer reviews section of the Amazon website. You want dog food made as a balanced diet with natural ingredients like meat (poultry, fish, beef), whole grains, organic fruits, and vegetables. This will ensure that the food is rich in vitamins, antioxidants, proteins, healthy fats, minerals, and nutrients. The age of your border collie will dictate what type of food you should get. The manufacturers often indicate which dog food is for puppies, adults, and senior border collies. The dog food comes cut into large, medium, or small kibbles, thus allowing you to choose the size that is best for your dog. Puppies and small breeds require smaller kibbles because they are easy to pick up and chew. How chewable the kibbles are? Most dog foods are processed with freeze-dried bites that are soft and grain-free to ensure their chewing and digestion is easy. How Often Should You Feed A Border Collie? The number of times you feed your border collie depends on its age mostly. A puppy will be fed at least thrice while it is weaning and as it grows older, the schedule can be changed to twice a day. Adult and senior border collies eat breakfast, lunch, and dinner. Nevertheless, if the dog is old or sick, you may want to incorporate bites, snacks, or treats in-between meals to ensure the dog is energetic all through. According to Wikipedia, 23.6 percent of border collie deaths are caused by cancer. Old age, on the other hand, claims about 17.9 percent of the deaths while cerebral vascular afflictions lead to 9.4 percent of the deaths of this breed. Other health problems facing border collies include genetic diseases like epilepsy and collie eye anomaly. 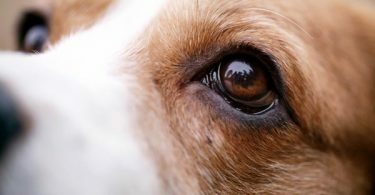 The American Border Collie Association argues that genetic diseases are the most common health problems facing this breed of medium-sized dogs. Other health problems that the organization highlights are deafness, Osteochondritis Dissecans (OCD), Progressive Retinal Atrophy (PRA), Elbow dysplasia, and Focal/Multifocal Acquired Retinopathy (FMAR).